Property Investing 101: Budget 2017: Does England need 300,000 new homes a year? Budget 2017: Does England need 300,000 new homes a year? The claim: Building 300,000 new homes a year in England would start to make housing more affordable. Reality Check verdict: Experts seem to agree on 300,000 as a good starting point but there is not universal confidence that it would make much difference to affordability. Chancellor Philip Hammond told the BBC's Andrew Marr Show that experts agree that 300,000 new homes a year would start to make inroads on the affordability of housing. The figure was recommended by a House of Lords economic affairs committee report last year, which described it as the minimum annual amount needed to meet demand in England (housing is a devolved issue) and "have a moderating effect on house prices". We've spoken to a number of experts to see if they agree. Malcolm Tait, professor of planning at University of Sheffield, said that the 300,000 recommended by the report "is on the high side of recommendations, but was derived due to their view that in order to keep house prices consistent with wages, this was the figure required". Richard Disney, professor of economics at University of Sussex, said: "The simple answer is this is a number plucked out of thin air, since affordability depends on price and income." But he pointed out that the Conservative manifesto of 2015 promised one million new homes by 2020 and that the pace of construction is going to have to pick up to meet that target. Between April 2015 and the end of March 2017, a total of 287,600 homes have been built, so if the government is going to meet its manifesto pledge from 2015 of a million homes by 2020, there will need to be a considerable increase in the next three years to an average of more than 237,000 a year. Steve Hayes from the Chartered Institute of Housing, said: "We would certainly agree with this - to meet existing and new needs, 300,000 is about right. Of course the key is what type of housing." By recent standards, 300,000 is a very high number - the last time that many were completed in a year was in the financial year 1969-70. Some of the experts disputed that 300,000 would make much difference to affordability. Prof Michael Oxley, director of the Cambridge Centre for Housing and Planning Research, agreed: "Saying we need around 300,000 per year for several years is not a bad generalisation, but this is more houses to meet the requirements of a growing population." He added that those extra houses would only have a very small impact on house prices. "For the impact on affordability to be significant, a very large number of the extra dwellings would have to be social dwellings supplied by housing associations or local authorities," he said. David Clapham, professor of planning at Henley Business School, said: "300,000 is the number required to meet annual demographic change. There is little evidence that this will impact on house prices unless it is sustained over a large number of years as new production is a small proportion of the total stock of housing." He also criticised the government's Help to Buy programme for making the problem worse by increasing demand and raising house prices further. Christine Whitehead, professor of housing economics at LSE, questioned whether that many houses could be built. "Would there be enough demand to make it worthwhile for suppliers to actually supply the housing? There are reasons why market completions have rarely exceeded around 170,000," she said. Lindsay Judge, from the Resolution Foundation, agreed with the 300,000 as a minimum annual figure, adding that: "In recent years, the 'affordable' homes that have been built are increasingly higher-priced varieties. A greater proportion of genuinely affordable homes to rent and own will be needed to make housing less of a living standards burden for families." 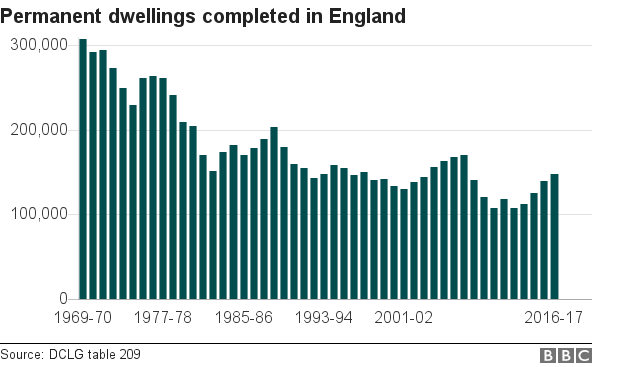 Since 2010, under the coalition government followed by the Conservative government, a total of 858,930 houses have been built at an average of 122,704 a year. The Labour government from 1997 to 2010 built a total of 1,894,930 new homes, an average of 145,764 a year. According to current projections, the number of households in England will increase by 210,000 every year between 2014 and 2039. Update 22 November 2017: There is another measure of homes built, which is net additional dwellings, which DCLG considers to be its leading indicator of housing supply. Net additional dwellings includes things like business premises being converted into residential property and subtracts properties that have been demolished. This measure is also well below 300,000 a year.